Dispenser box with 25 pcs. In the handwash brushes and wash gloves category, you will find utensils for the cleaning of animals, people and practice rooms. Handwash brushes are used in all medical settings to clean hands and nails. In this category, Praxisdienst-VET offers special handwash brushes which are ideally suited to the cleaning of hands before operations, thanks to their sterility and soft bristles. 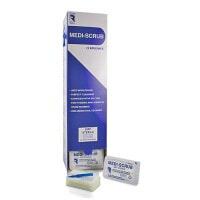 The individually packed Medi-Scrub handwash brushes consist of a brush, sponge and nail cleaner. They are specifically designed for the needs of doctors. As well as individually sterile-packed handwash brushes in dispenser cartons, we also offer wash gloves. These disposable items are also suitable for cleaning animals or surfaces in the practice. The use of disposable products effectively prevents the transmission of germs throughout the practice. They are disposed of after use and so save the vet the high personnel, energy and material costs of their professional preparation. Veterinarians and animal groomers can order supplies such as handwash brushes online and at affordable prices from the Praxisdienst-VET shop. Not only can you expect low prices and fast delivery, but also competent customer service by phone, e-mail and Live Chat!